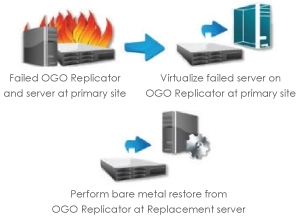 The OGO Replicator is a fantastic Business Continuity Appliance that combines a suite of solutions for windows servers by uniquely acting as both a failover server and a backup/recovery device. This Business Continuity Appliance provides either device to device backup or device to vault backup. The system can do up to 15 minute snapshots both locally and offsite depending on your bandwidth. Click here for a bandwidth estimator. In the event you lose one of your servers, the business continuity appliance can stand in as a failover server within minutes, keeping your organization running and connected with current data. The appliance allows you to greatly lower your RPO, Recovery Point Objectives, and your RTO, Recovery Time Objectives by efficiently sending backups offsite while enabling most servers to be recovered within minutes. Additional features include bare metal restorations to dissimilar hardware, a sandbox environment to test patches, software upgrades and configuration changes before applying them to the production environment, and the ability to run monthly/quarterly/yearly reports without touching the actual production server. Aside from the technical features – the Business Continuity Appliance is provided as a service and includes fully managed backups, offsite data transfer, monitoring, annual DR Testing and managed recovery. To determine if the Business Continuity Appliance or BCA is right for you – first determine your MAO, Maximum Allowable Outage. This will help you determine the value of your data and meeting your RPO and RTOs. The solution ranges from $75-$200 per server per month inclusive of Annual Contingency Testing and any Recovery Work. Assuming the value is more than the price – you should have an easy justification for making your life a lot easier and less stressful. Contact us today to learn how your business can recover faster with OGO Replicator. Compare the Business Continuity Appliance to Commvault, Evault, Symantec.